Rougois Mechanique collection skeleton watch (Pronounced "Roojwa"). 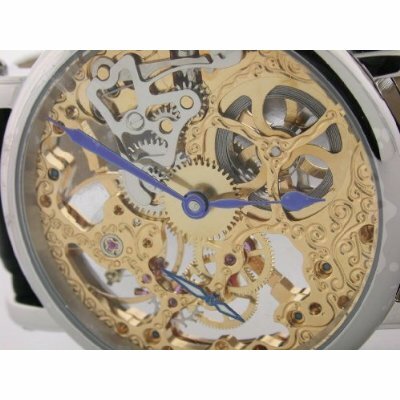 Beautifully decorated two tone mechanical wind up movement with rubies in place in the moving parts. 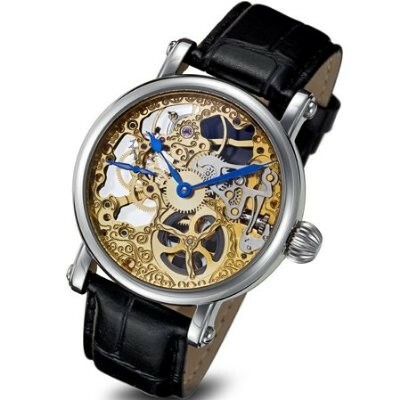 This is not only very functional watch but also very captivating and mesmerizing to look at the skeletal movement in motion. The polished steel bezel adds elegance to the appearance. 44mm wide stainless steel case. Large wind up crown for ease of setting and winding. 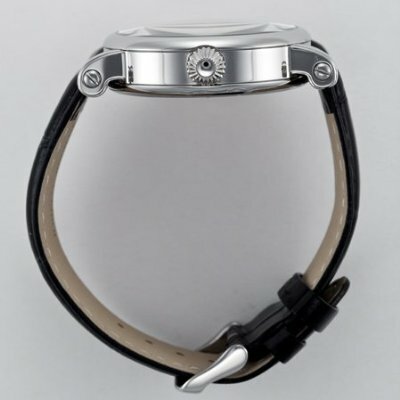 Black leather strap with polished steel plated inserts & scratch resistant mineral crystal Blue color hour & minute hand. Second hand is next to the "9" position on the left side. Push pull crown and water resistant to 30 meters. 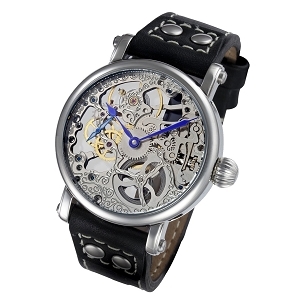 Been looking at skeleton watches for a while, this one is the best! Outstanding quality, it is so much nicer than a picture can show! Speedy delivery, excellent service. 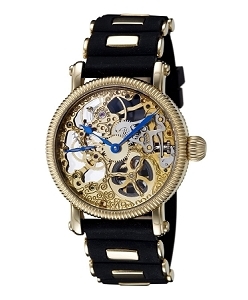 I bought this watch as a gift for my fiance and we both absolutely love it. 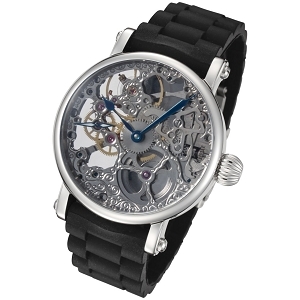 He particularly likes the fact that it is a wind-up watch since these are harder and harder to come by these days. 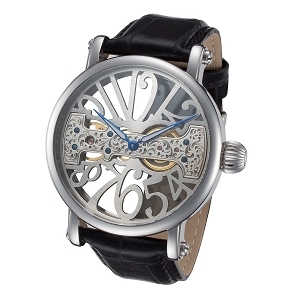 The detail and quality of this watch are absolutely beautiful, and it looks even better in person than it does online. I couldn't be happier with my purchase... not to mention, this deal is hard to beat! Love the watch. 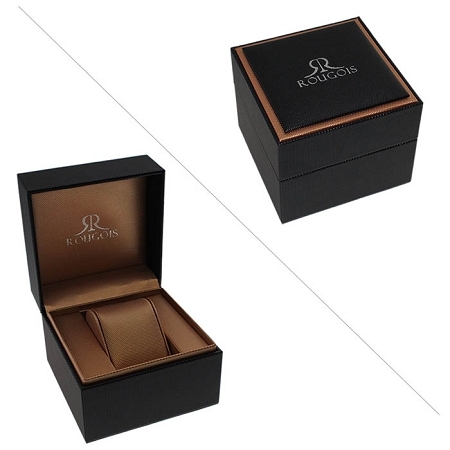 Easy to use, very comfortable, and stylish. The two tone is definitely a better look with the blue hands and gold gears. Seems to be a very solid design. Very good quality band as well, little bit of padding, and very sturdy. 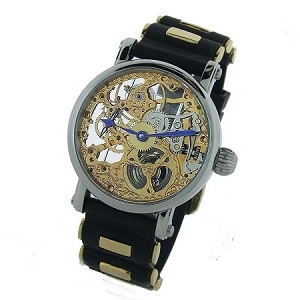 Beautiful watch at a great price.